Have you ever imagined a thrilling adventure down the Salmon River? Oar in hand, you speed through the wilderness as river spray covers your craft. The sun is shining, and a smile is on your face. There are many incredible companies that can get you out on the water during your stay at Triangle C Cabins, and one of the best is White Cloud Rafting Adventures. See what they have to offer! Our rugged Idaho wilderness awaits! Take advantage of our complimentary Adventure Guide to start planning your getaway. Whether you are looking for other companies like White Cloud Rafting Adventures or the best backpacking trails, our free guide can help. Now, you can spend less time planning and more time exploring! Located in Stanley, Idaho, White Cloud Rafting Adventures has been offering excursions for more than 15 years. They have trips designed for all ages, so you can enjoy yourself whether you are a beginner or a seasoned expert. Their knowledgeable guides can take you river rafting, kayaking, or on a fishing tour. You can trust that they will keep you both safe and entertained while you are out on the water! White Cloud Rafting Adventures offers river trips for both beginners and experts. You can choose between half-day and full day excursions, and each individual trip is categorized by how challenging it is. No matter what trip you choose, you’ll be surrounded by the gorgeous scenery of the Sawtooths that you can enjoy as you float! Half day trips come complete with snacks, and full day trips will take a break on the banks of the river for a homemade lunch. We love White Cloud Rafting Adventures’ kayak trips because they provide inflatable kayaks plus all the gear you need like helmets, life jackets, booties, and more. 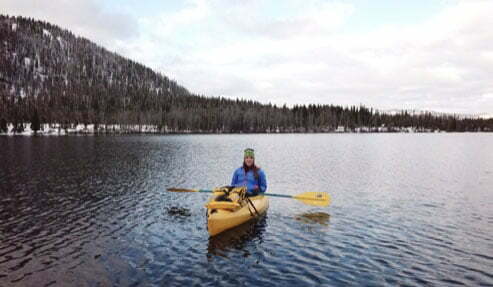 These inflatable kayaks have the best balance and maneuverability! You can choose between half day and full day trips; each begins with an orientation so you can feel comfortable in your craft. Do you want to cast your line on the Salmon River? White Cloud Rafting Adventures can help! If you have never been fly fishing before or need to brush up on your skills, we recommend the Fly Fishing Clinic. This 4-6 hour course will make you an expert in no time! Then, you can graduate to their half day and full day fishing trips. They’re so sure that you’ll catch a fish that they guarantee your money back if you don’t! It’s time to start planning the adventure of a lifetime in Central Idaho! Let Triangle C Cabins be your home base for all the incredible excursions you will experience. 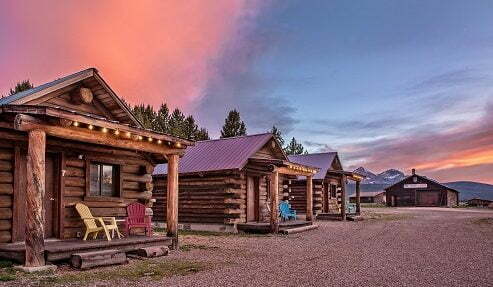 Whether you are floating down the river with White Cloud Rafting Adventures or mountain biking through the Sawtooths, you’ll love coming back to our cozy cabins. Challenge some friends to a game of volleyball, roast some marshmallows over the campfire pit after a long day of exploring, then relax in your log cabin! Check availability and book your stay today.